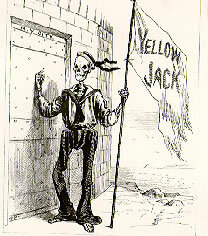 Most of us don’t think much about yellow fever nowadays. There are still a couple hundred thousand cases, and some 30,000 deaths, each year, but almost none are in the first world. Out of sight, out of mind. But this indifference is new. Until the beginning of the 20th century, yellow fever ran rampant, and was one of the most dreaded of all diseases. 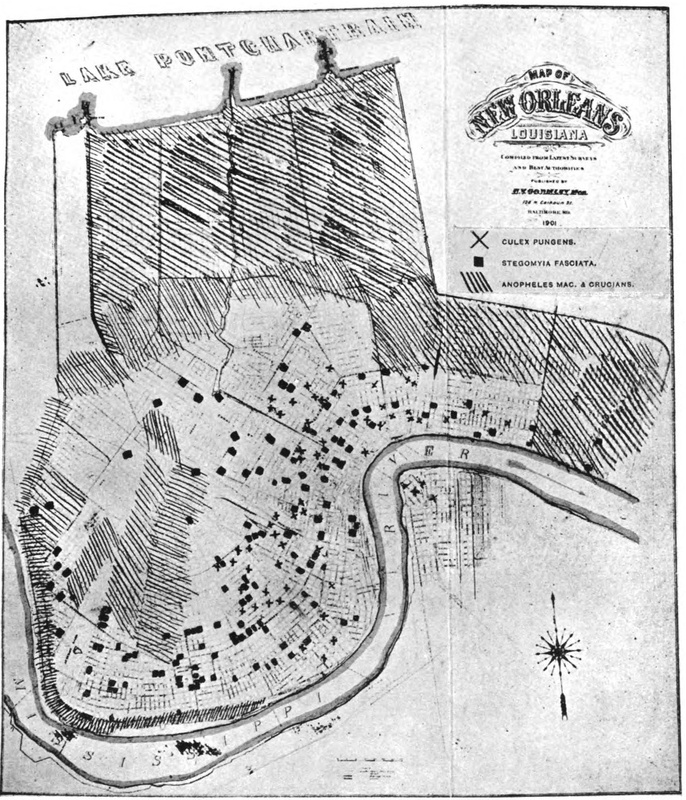 Epidemics of yellow fever in New York, Philadelphia, Memphis, and New Orleans killed tens of thousands. There’s a WHO manuscript [pdf link] on yellow fever that lists these and many more outbreaks – page after page of fine-print dates and deaths. Those who have not lived between Cancer and Capricorn can well fail to conceive readily the sensation of numb, chill dreariness which steals on all hearts, when the news spreads, from mouth to mouth, that Yellow Jack has once more come. … at last it is admitted on the housetops, as well as whispered in the closet, that the deadliest, most awe-inspiring of the plagues of the equatorial regions has obtained admittance within our borders. 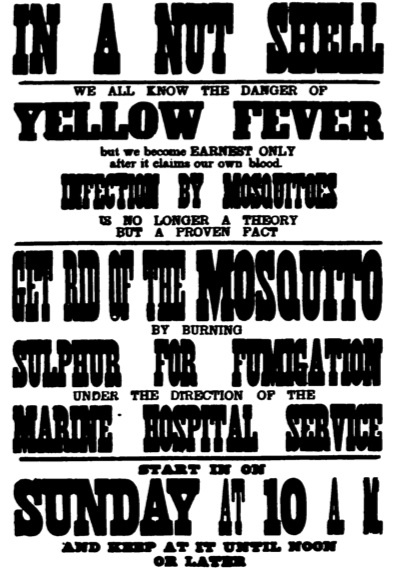 As I noted earlier, Carlos Finlay made the original suggestion that yellow fever was a mosquito-borne disease in 1881;2 in English, in 1886. 3 Walter Reed and his team confirmed this in 1900, and the discovery was seized on at once. 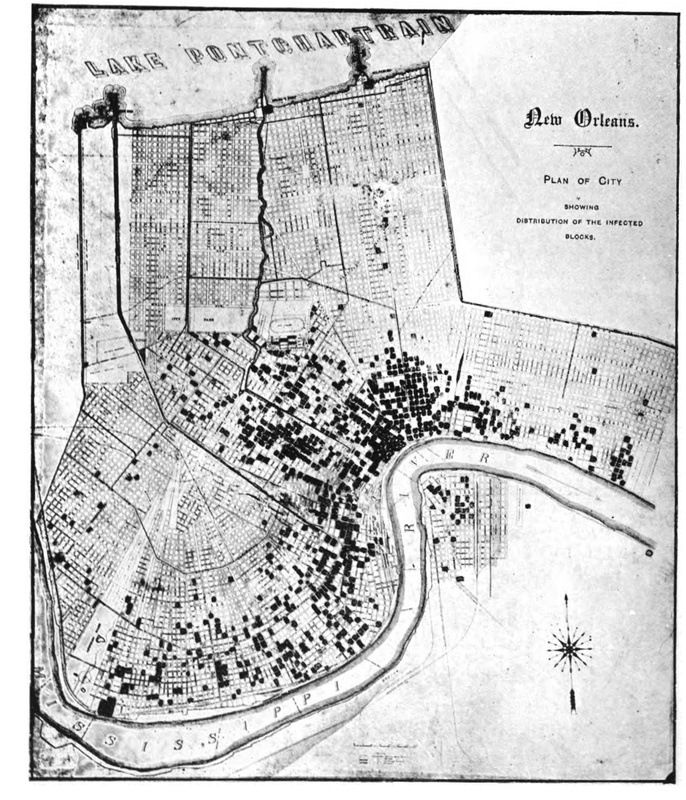 “Shows the Distribution of the Principal Mosquitoes of New Orleans”. Dark squares represent Stegomyia fasciata, the major carrier of yellow fever 4 Yellow fever cases in New Orleans, 1905. New outbreaks were checked with enthusiastic mosquito control. No, Jim, we can do science to find out how they occur. Outbreaks WILL occur, both statistically and biologically. Praying will neither stop them nor cure them.